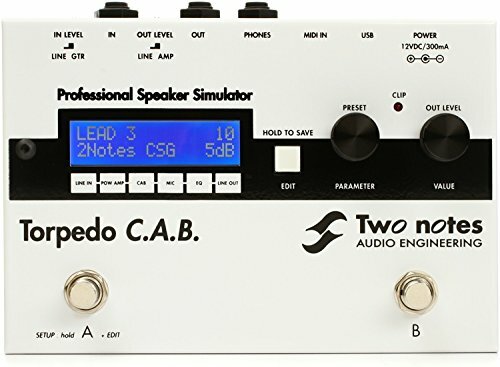 A high-end guitar and bass simulator in a handy stompbox format, the Two Notes Torpedo C.A.B. lets you ditch your bulky amp, without leaving your tone behind. It's designed to sit between your pedalboard and the PA or your recording rig, providing you with the realistic depth and dimension you'd get if you miked a real cab with top-of-the-line studio microphone. Onboard, the Torpedo C.A.B. lets you choose from over 50 world-class guitar and bass cabinet models (store up to 32 at once) modeled with incredible impulse-response technology for freakish accuracy and total tweakability. And with two programmable footswitches onboard as well as MIDI input, so you can jump from model to model and tweak pretty much any setting you want to live. If you have any questions about this product by Two Notes, contact us by completing and submitting the form below. If you are looking for a specif part number, please include it with your message.